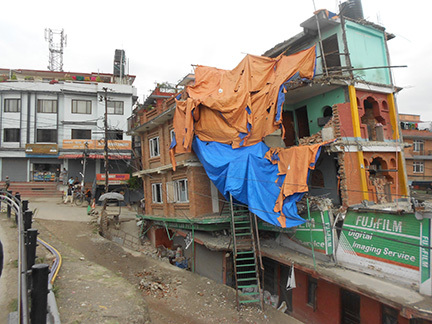 One week after the initial earthquake [April 25] we had three teams on their way to priority areas. Every trip included a delivery of needed products plus an assessment of damage. The most heroic team crossed a 17,0000-foot snow-covered pass and scrambled over avalanches that covered trails more than 50 years old. The end result is that we have first hand eyewitness facts as well as the personal voices and requests from these hardest hit and most devastated areas. The devastation is extreme. The needs seem endless. Your prayers and generosity will help us meet these needs. Our approach has been to set emergency goals, pre-monsoon [June 15] rain priorities, end of year projections, and long-term [2-4 years] estimates. We re-evaluate these every three weeks from our experience and new information. We were told that the wisest decisions that lead to effective actions are made weeks and even months after the initial disaster. This is a work-in-progress that needs critical examination as things change. The problems in Nepal won’t be solved soon. On Sunday, June 7th, I traveled by helicopter to visit and bring supplies to villages beyond the 17,000-foot pass. Due to our proven 18-year record of humanitarian and spiritual service throughout the country, we were able to charter a helicopter from Mission Aviation Fellowship at a greatly reduced rate. The day prior to our flight we sent two trucks loaded with tarps for weather protection and food supplies to the end of the road in Rasuwa District. Needed goods were distributed to the villages in Rasuwa. From this staging area additional goods were flown to the inaccessible villages in the Dhading District. On Monday, June 8th, a third truck delivered 600 bags of rice plus salt and cooking oil to Rasuwa. Our Rasuwa team returned to Kathmandu on Wednesday. Thursday we had our meeting to review, learn, re-evaluate, and refine our goals. Our next outing will be to some high hills in Makawanpur, an area southeast of Kathmandu. The monsoon rains will make this area inaccessible in a few weeks. Our learning curve tells us to order fewer tarps and provide more tin [aluminum] sheets. This is better for weather protection now and will also serve as roofs when we can build a more suitable house for the winter. 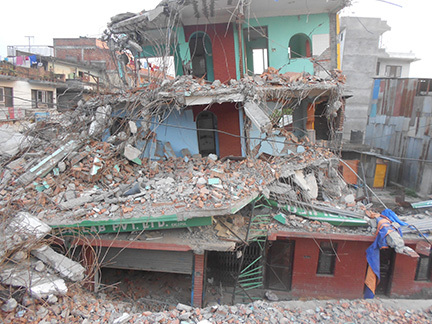 Nepal Center For Biblical Studies has been the hub of relief and aid activities within the church in Nepal. We have hosted, fed, and provided beds for numerous aid workers from many countries. Our students have been active in delivering blankets, food, weather protection, as well as giving spiritual encouragement. NEEDS …. GOALS: Food. Better housing and weather protection. Goal #1 is to survive the first monsoon and winter with the fewest casualties. Goal #2 is to provide some level of decent daily existence to life in these devastated areas. The long-term goals are to restore some normalcy to their lives with housing, self-sufficiency, school for children, and to meet their spiritual needs with [a] Bible classes in their area for all Christians, and [b] having their leaders gather in selected sites for special classes and encouragement. The ultimate goals are spiritual food, maturity in righteousness, and eternity in heaven. We all have a greater appreciation for how good life has been to us. We have a deeper understanding of the meaning of “count your blessings.” It is a humbling experience to see both the smile and the tear as a mother says “dhanyabaad” [thank you]. That smile of gratitude, the tear of relief and the soft “dhanyabaad” are meant for you because of your compassion and generosity. Last Thursday Parsuram, Gajendra, and I met to review the past expenditures [time, work, and money], the results, the present needs and priorities, and our plans for the future. The next ten days present a unique opportunity. Mike Brooks has been averaging one or two mission trips to Nepal for the past 20+ years. Sometimes he will visit a certain area and other times he will gather leaders together in central locations. Mike will have a meeting in Kathmandu beginning tomorrow through Wednesday. Christian leaders from the mountain communities [Rasuwa, Dhading, Thanahun] will be the primary visitors at this meeting. Later this week he will meet with Christian leaders from southern Nepal in the city of Narayangadh. Each of these meetings will focus on [a] the present spiritual health of the church in these areas, [b] the earthquake damage and the needs, and [c] having Bible lessons, fellowship, and giving encouragement. Parsuram, Gajendra, Shanti, Kaziman, and Depak will accompany Mike and actively participate in the meetings. Through group sharing and discussion during the meetings, and by personal conversations with Christian brothers, they will learn many things about the conditions in all the Districts that have suffered the greatest damage. This will help us to make wise decisions and to work closely with good cooperation to maximize our efforts. We plan to deliver 300 bundles of metal sheets during these meetings. These metal sheets are called tin, zinc, or aluminum, but every term refers to metal siding useful for weather protection. The size is usually 9 ft X 3 ft or 12 ft X 3 ft. They also vary in thickness and quality. There is such a short supply that we are getting whatever we can get our hands on. This is desperately needed because of the monsoon. While the monsoon would not wait for us to get ready, neither will winter. We will also be talking about safe and warm housing for the high mountains [Dhading and Rasuwa] before the snow comes. Villages are 5-10 miles south of the Tibet border, which is also the 20,000 feet spine of the Himalayan Mountains. We are limited in time, money, and proper materials. However, there is no limit to the problems and needs. That is why we must act wisely. The voice we will hear from our brothers in the next week will be a great asset and help leading to good judgment. Our greatest help is our God. His wisdom and power are limitless and endless. Our next meeting will be after Mike leaves [July 2]. Please pray for Nepal. Posted on June 21, 2015 by Robert Turner and tagged Extensions Nepal.